Health and wealth – the two seem to go hand in hand. While we obviously talk a lot about money around here, this week’s episode deals with the importance of developing great habits with your finances and your fitness. My guest, Brad Barrett, explains how he was able to adopt a healthy lifestyle, while staying frugal. The co-host of the popular Choose FI podcast shares his advice on cutting out the junk, eating better, and exercising more, without it hitting your wallet. There’s not a rule that says you need to sign up for an expensive gym membership to get in shape. In fact, there are many low cost exercises you can start in the comfort of your own home. In Brad’s case, it was a $15 pull up bar, and free online yoga programs that jump-started his journey to better health. As with your finances, the best time to focus on improving your health is right now. But, as Brad explains, be careful that you’re not limited by your own beliefs. “I can’t become stronger, or more flexible, because I’m not that type of person.” Does that script sound familiar? All too often, the only thing stopping us is ourselves. Calling all socially responsible investors! Our sponsor this week, Wealthsimple, will build you a portfolio which favours low carbon, clean tech, human rights, and the environment. Get started with socially responsible investing today by visiting Wealthsimple. Health and wealth. Those two things seem to go hand in hand. Whether it’s New Year’s resolutions, it’s just those of us who want to stop the bad habits and get on the right track. Well, we obviously talk a lot about money here but what if you wanted to be healthier without it knocking off your road to financial freedom? 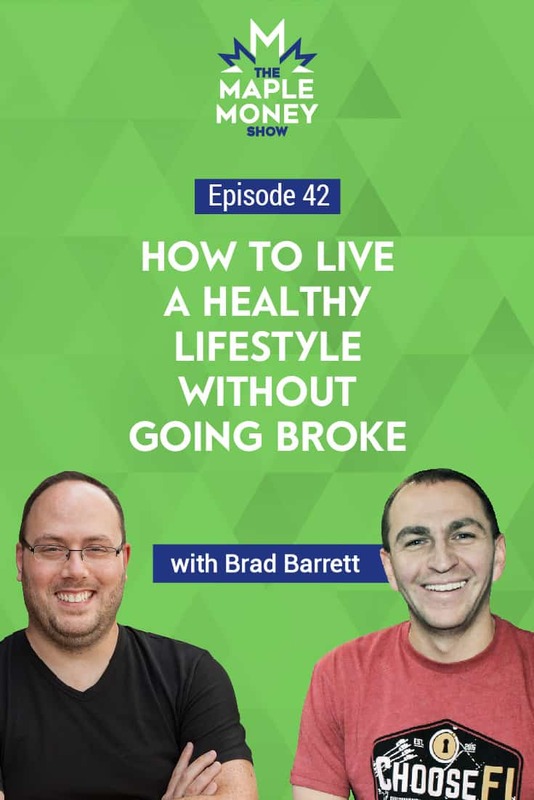 Brad Barett from ChooseFI joins us this week to discuss how he was able to adopt a healthy lifestyle while still staying frugal. You can cut out the junk, eat better, exercise and simply get fit without it hitting your wallet. Tom: Hi Brad, welcome to The Maple Money Show. Brad: Hey Tom, thanks for having me here. I appreciate it. Tom: I wanted to have you on because I know you mix two things very well. One is a healthy lifestyle without having to make it become an expensive lifestyle. Can you take me through your journey with both becoming healthier and how you were able to do that without it becoming too un-frugal? Brad: It’s a good question and journey is the perfect word. If you (or somebody else) asked me for my “expert analysis on health” ten years ago I would have laughed in your face. It would have been just implausible. Tom: I assume that no one starts out healthy as a kid and continues that way forever. But go ahead, go on. Brad: You’re absolutely right. When I grew up I played soccer. I was fit and then college hit. You know, the freshman 15 pounds and I just never got back to being that fit guy I was previously. In my mind was like, “Okay, I’m not a fat American. I’m not your standard obese American so maybe I’m ahead of the game.” But looking back I probably weighed about 30 plus pounds more than I do now. And that’s just unhealthy. I don’t know how I let myself get there, frankly. I think I was living that life where I was going to work, trying to do the best I could with my time, my commitments, and my kids. Health and fitness just kind of fell by the wayside. And over the last five years I’ve really just started focusing much more on fitness and health and specifically on food, actually. Tom: Personally, when I was in college despite all the bad habits I had, I must have had a high metabolism. I was just skinny throughout school. For me, gaining weight came when I had children. I just started getting too busy and lazy with things. So it’s only I’ve been working on now. I still have more to lose but in the past six months or so I’ve been actively losing weight. We’ll get into that more as we go but I wanted to cover fitness first. What do you do activity-wise and how were you able to make that affordable? Brad: I think when I first started this journey towards fitness and health; I was trying to do it as low-cost as I possibly could. A lot of that meant doing exercise in the house. Just simple things like push-ups. I bought a $15 pull-up bar to put on my door. So yeah, push ups, pull ups, maybe some running. Though, in all honesty, I hate running. It’s just not exactly my thing. And I actually wound up finding some yoga programs online that were free. There’s this one podcaster named Mark Devine. He’s a Navy SEAL and he has a program called, Steel Fit. I ended up doing what he calls, warrior yoga. And I just loved it. I always had this script in my head that I’m not this type of person. I always said to myself, I’m not a flexible person. Even when I was a pretty good soccer player in high school I was so inflexible. It wasn’t that I was that type of person. It was that I never spent the time and energy to become flexible. So once you get over that limiting belief this is a macro thing. You have these limiting beliefs that hold you back in life. And you have to get over them. For me, becoming flexible actually became one of my life’s goals. I know it sounds strange for a mid-30s, father of two to want to become flexible. So I did this yoga program. I bought a foam roller from Amazon for $12, a bunch of lacrosse balls and I was doing like my own myofascial release with these lacrosse balls and the foam rolling. I was just trying to become more flexible. And I got to the point where I could touch the ground with my palms. It was insane! I got at least two feet of added flexibility. So again, this is a bizarre little example but what it shows is if you pay attention to something and dedicate yourself to something—It didn’t happen in a month or two. It took me almost two years to get to that point. But I just kept working at it five or 10 minutes a day. And I think that’s a microcosm for how I’ve gotten healthier over the last five years just in general. I’ve done these little things. I never wanted this to overtake my life. I’m fairly busy. Even in this financial independence world I’ve carved out for myself in order to have this great life, I’m still busy. And I don’t have three hours a day to go to the gym. And frankly, I don’t want to do that. So I tried to build this in, in little micro increments and that’s how I looked at it. I had the pull-up bar in my doorway so when I walked by I would do a set of five or seven pull-ups. Now, how long does that take? It takes 10 seconds but I just did seven pull-ups and that’s not nothing. I tried to build these little things into life. And that’s kind of how I started with this, I guess. Tom: Speaking of limiting beliefs and not having three hours, that’s been the problem with me. I always think of how busy I am and that I don’t have time for exercise. And I still haven’t really found time. As a family we’re getting better about going for walks and stuff as a starting place, just to get those steps up on the watch and everything. We have exercise equipment that is gathering dust so there’s no excuse. I do like the idea of a pull-up bar though. I could literally put it on my office door here and maybe get some use of that every time I walk through the door. Brad: No, just make it a thing. Every time you walk through the door, pick a number. I don’t care what the number it is. Make it one, two, five… it doesn’t matter. But whenever you walk under that door just do that number in pull-ups. That’s a cool little thing to just build it in. Just like anything in life, you need to find what works for you. You might read 10 articles that say HIT training—high intensity interval training is the biggest thing or that going out and doing steady running for an hour is the best thing you could do for your heart. I’m just making stuff up here, but at the end of the day if I personally am never going to go out and run for an hour, I don’t care if it’s the best thing in the world. I’m never going to do it, right? I need to find something that is going to work for me. I then moved on from these little snippets of exercise to group exercise classes. I went to a local place called Crunch Fitness here in Virginia. I think it’s a chain throughout the United States. And for basically $20 a month you could have an unlimited number of group exercise classes. And I was one of only a few men in these classes. It was mostly women-oriented. But honestly, I didn’t feel uncomfortable at all. I thought they were fantastic. It was this camaraderie of people working hard. And you see them suffering but they’re keeping at it. There’s just something to that and I think that’s why a lot of these group exercises like cross-fit which is a major one are so successful. In my opinion, it’s not because they’re intense or you get great results. There is always that, but it’s the camaraderie. Those people are expecting me to be there at that class because I was there on Tuesday and I told them I’d be there on Thursday. You have to find what works for you. I ended up going to those classes and as I get fitter I looked for the next challenge. And for me it actually was cross-fit. I’m not a crazy cross-fit guy so don’t worry, I’m not going to go on about it. But it was this great challenge for me. I was basically a 37-year-old guy wondering if I could lift weights and get fitter, stronger. It was just something that I’d never done before. I never lifted weights in my entire life, essentially. I had gotten to the point where I had no idea on how to even do something simple like a dead-lift which now seems simple to me. But back then I didn’t even know how to do it. So it’s cool to just learn new skills. I think there’s a huge amount of satisfaction just as a human being in trying to learn new skills and trying to attain some form of mastery. Tom: I like the idea of going and exercising in public because I can see how that would be more motivating. Like with us on the business side of life, if you have a mastermind group you feel like you owe the rest of the group something. Like you said, if you’re there on Tuesday and you say you’re coming back, the pressure is on you to actually come back, right? Brad: Yeah. Yeah, accountability is a huge aspect of this. You asked me about how did I save money, right? So cross-fit clearly is not inexpensive. Though this is not day one, again, it was a challenge for me and it was something that I really wanted to do. I did find a kind of frugal hack at my particular gym. Of course, I ran all the numbers and realized we were taking a family trip in August for most of the month, and then I go to conferences and all these other things so getting a yearly membership just wouldn’t make sense for me. It would just kind of eat me alive if I’m like away in August and I’m paying $160 a month for a cross-fit gym in Virginia. So I ended up doing these punch cards where you’re just basically pre-paying for classes. When you show up, one of those comes off your list. So it mediated the need to have that membership. While it wasn’t a huge money savings, it’s probably 20 percent off right there just in terms of the number of classes I’m attending so that’s what I’m paying for. That was a nice thing. Then I realized there’s actually a program my co-host on ChooseFI, Jonathan did. It’s a program called Strong Lifts. It’s an app called Strong Lifts, Five By Five. I’m doing this with a buddy of mine who lives right around the corner. I have the equipment at my house so it doesn’t cost anything for each subsequent time. And we’ve been doing it now for a month and a half, essentially every other day. So that saves me all that money that I was spending at cross-fits. I’ve kind of come full circle; in essence, to how can I do really intense exercise now for very little money. And certainly no marginal cost for it. Tom: So is this app t just sort of guided workouts? Brad: Yeah, it is. He runs you through the whole program. It’s basically to get progressively stronger. You start with very, very, low weights on the squat and dead-lift and bench press—those kinds of things. Just a couple of the major compound exercises. And you start small with just an empty barbell. Then he basically adds five pounds every time you do it. We’ve worked little under two months and I think we’ve more than doubled all of our weights to the point where I’m getting to “personal bests” almost every single time I work out, and I just keep getting stronger. I can vouch now, after six plus weeks that it really, really works. Again, you talked about accountability. It’s fun to have a workout partner. It really is. For me, that makes a difference. Tom: I’ve found that even with these family walks, the kids are really pushing me to keep at it. If we don’t do one—well, we get away with skipping a day but if we hit two days, then it becomes, “Why aren’t we going for walks?” So we go out. And we have a bunch of walking paths around our house and stuff so it’s very handy. There’s no excuse not to do it. But my kids are my biggest activity buddies right now. Let’s switch over to the food side which is where I found some success so far. I’ve got a ways to go still but it seems if you’re watching what you eat that goes a long way. Maybe even more than the exercise side of it. What I’m seeing so far is if you don’t put that junk in yourself in the first in the first place, it can help a lot. Let’s start from the beginning. How can you save money in a grocery store while making sure you’re eating healthy? Brad: That’s a great question. I think planning is clearly the most important aspect of it. You really should have my wife Laura on right now to talk about this because she is a master at meal planning. She’s a master at finding recipes that she knows we’re going to love and are going to be delicious. Any time you get into deprivation saying, “Oh, I’d love to have this meal but it costs you too much.” Or even worse, “I’m on a diet.” Personally, I don’t think that diets are the long term solution for your best life. Anytime you have a deprivation mindset, it almost invariably comes to an end and that end can be sometimes worse than where you started. For me, in my life I’ve probably lost about 30 or 35 pounds in the last handful of years. And Tom, I like to eat. I mean, I’m an eater. I come from a long line of eaters. If I didn’t make changes it was going to trend in the wrong direction, and it was going to trend that way for decades. So the way I mentally approached this was to look at my portion sizes. What’s a way to save money and to get healthier? It’s cutting your portion sizes. If my wife Laura makes a meal that she thinks is going to last for each of us for two nights and I pig out and have too much, then I just dramatically drove up the cost per meal. Then I screwed up her whole plan because that means more time because she has to cook again. Or much worse, we have to grab takeout or something like that. I think that was a big key for me, just starting there… Just looking at our meals and saying, “Do I really need all this food ingested at every single meal or can I get by on less?” We look back at what we used to eat when we first got married and we are horrified. It’s almost unbelievable how much garlic bread we used to eat and all these other little things. We just don’t do that anymore. But it wasn’t overnight. It wasn’t going from one loaf of garlic bread to none. We really liked garlic bread so we decided to cut the garlic loaf in four, freeze three quarters of it in three separate sets of aluminum foil and eat one quarter for dinner that night. Then when we needed a little side for our next meal we have that quarter there in the freezer. So this was the skill of planning and also making it obvious so you can’t self-sabotage. If the food isn’t there, I’m not going to defrost a quarter loaf of bread and make it real quick while I’m so hungry. That’s inconceivable. Those are some of the strategies. Personally, I also cut down fairly significantly on carbs and sugar. Just in the bit of research that I’ve done—and I’m not an expert, Tom. This is just my own anecdotal thing of what’s worked in my life. It seemed like the great culprits were carbs and sugar. I didn’t cut them out entirely. Again, that’s deprivation. That doesn’t work, in my opinion. So the question was how can I slowly cut them out? How can I substitute them? Those were the strategies. But then how do you save money? You plan. I mean, this is what Laura does; she goes shopping once a week. She has her plan to essentially to cook two meals. She hopes that we can get a minimum of two dinners out of each of those meals for each of the two of us. So one meal might be Monday and Thursday and the other might be Tuesday and Friday. We have Wednesday set up for this great tofu night which, if you would have asked me about having two years ago I would have laughed in your face. But, we now have fried tofu with all these different sauces. They kind of take the place of chicken wings for us now because we have buffalo sauce on one and Parmesan garlic on another. It’s just delicious. Anyway, that’s become a highlight of our week. But again, it’s planned for. That’s the crucial piece. Wednesday’s are that and then we have these two other meals that she’ll cook so it’s just obvious… we’re not overeating. The ingredients are bought at the same time so Laura usually tries to kind of pair them so that the worst case scenario is you buy an ingredient that only requires half of a jar and then it goes bad because you don’t need that other half a jar because you’re not cooking anything. So you might have planned right about the cooking but then you’ve got these ingredients going to waste. So she tries to pair them together so that we are not wasting ingredients also. To me, it’s healthier because we’re not eating out. We’re watching our portions. The time is minimal. And it doesn’t cost that much. Talk about wins all around. That is really at a very high level in our strategy. Tom: We’re a carb family for sure. It’s certainly something I realize we need to cut down on. Not going a full Keto diet or anything. I get the idea of it. But yeah, I agree with you about deprivation. One thing I’ve been doing— I’m also a big meal eater. I can get my money’s worth at a buffet. But one thing I’ve done that sounds like deprivation but it really isn’t once you get used to it is intermittent fasting. I’ve lost about 15 pounds doing this where I simply eat between 12 pm and 8 pm. I’m basically skipping breakfast which is actually really efficient. Just wake up and get started with your day. It’s a plus now. It’s not this feeling of, “Oh, I’m missing a meal and that’s going to distract me.” My mornings are really, really, efficient now. You just wake up and grab your morning coffee or tea then get into your day. Then on the other side after 8:00 p.m. I’m not eating all the chips in the house that I would snack on in the evening. So I’ve lost about 15 pounds. It’s probably a little bit more right now and it’s saving me money. That’s one less meal a day and I’m skipping a lot of chips and pretzels and anything else that would come out once the kids went to bed, basically. And like you said, just not having that stuff in the house makes that become easier too if we’re not buying all the junk food and stuff. If it’s not there it doesn’t get eaten. Maybe it’s not for everyone, but I think if people gave it a try they’d probably really like it. It only probably took me less than a week to kind of get used to that. And now, if I’m travelling and I have to eat breakfast just because of the flights and all that just to get a meal in somewhere, I feel very lethargic. If I have three meals or if I am snacking in any of these kind of times where I’m cheating due to travelling, it just makes you feel slowed down and bloated. So I like the feeling of only eating in that 8 hour window. Brad: I’ve tried intermittent fasting before as well and have found real benefits to it. I feel like so many of us plan our lives around those three meals as if something catastrophic is going to happen if we don’t have one of them. I know when we go on vacation everything’s planned around those meals. But that’s not ideal. I don’t want to be beholding to my appetite. I want some level of control and I’ve found by doing that intermittent fasting, when I was in an odd situation like traveling, for instance, I just didn’t need to eat as often. I was more cognizant of what was truly hunger versus when I was eating just based on the clock. It sounds like a little thing but that level of control and knowing that something terrible isn’t going to happen if I miss a meal—there was great satisfaction in that. Tom: Yeah. Even if you did feel a little hungry. Say you’re stuck on a plane and you’re not going to eat easily, even if he did have a slight feeling of hunger, you get used to it. It’s something you can press forward and it keeps you a little more motivated. If you’re sitting around and you’re not eating, you’re losing weight. There are calories being burned just by breathing as long as you’re not just constantly feeding yourself. One thing I find, again, with traveling is that you kind of get back to that expectation a bit of eating three meals. Say I’m with my family. My kids are not intermittent fasting so we’ve got to go to a restaurant and have breakfast. So, it throws me off then. But otherwise, it’s the schedule I’m really liking. But certainly, the next step is being a little more mindful about the foods I’m eating. Intermittent fasting has allowed me to be a little easy with that. If I want to eat a big meal it’s kind of okay because I still need to get my daily calories in. I need to still make sure (now that I’ve made it this far) I try to eat better foods. Brad: You’re a big carb family and we certainly are too. Is that the first thing that you’re going to attack? Are there ways you can just pull a little bit out? Again, the deprivation—if you go full deprivation mindset, it can be terrible. And in my opinion, it will probably fail. Is that the next frontier here—trying to cut out things? Tom: Yeah, yeah, cutting out carbs and monitoring portion sizes. You mentioned the garlic bread. One thing we were doing (which is terrible) when we ordered pizza—not only is pizza bad in the first place, we would order a large pizza each because we both wanted different toppings. It’s not that we sat down and ate a whole pizza. But the fact is there’s all this pizza left. In making that decision it almost became a three-meal decision. It was as though I was going to eat pizza for dinner and for the next day’s lunch and dinner. It became this big problem where it wasn’t like eating pizza just one time. It became having pizza for the next day and a half. We don’t do that anymore. Now we’ll split a medium pizza so it’s just one meal. We’re still not depriving ourselves. We’re still having pizza when we want to have pizza. We try to do it once a month so this isn’t a constant thing. We do it so that what we order in is literally “a meal” and doesn’t become a half week decision. Brad: No, that makes sense. One strategy we would employ actually in that particular instance is if we’re getting pizza we’re not going to overeat, we just freeze the leftovers. We do this a lot. That’s just one example. My wife makes literal use of our freezer in terms of her meal planning because, again, this is a lot about time as well. How can you be most efficient in time and in dollars is how we look at it while still eating wonderfully. I want to make it clear to everybody that I eat really, really, well. My wife is a great cook. We’re not doing this to save money. We want to eat well. We want to have the best life we can. And obviously, if we can save money in the process significantly with this kind of function. We’re trying to do all of the above. But we’re not eating bad meals like pasta and sauce or puff and butter all the time. Last night we had chicken schwarma my wife made from home. And it was phenomenal. I would have paid $15 for that in a restaurant. And it costs only about $3 when we included the Nan bread. If we didn’t have the Nan bread it would have been about $2 for my meal. That was amazing. Anyway, what Laura does is batch cook. For instance, she’ll set aside a morning to basically buy something insane like 10 pounds of chicken breast or chicken cutlets and she’ll bread them, fry them up and then put them into individual portions in the freezer so we then have “X” number of meals. It’s something crazy like 20 meals worth in the freezer that she can pull out whenever she wants. It’s amazing. What a great time savings that is. She just, boom, boom, boom… it’s all done in an hour and a half. Then we have10 to 20 meals just built up for us for the next couple of months. Hopefully it’s getting across to the audience here that it’s the strategy. It’s how you think about this in terms of holistic planning to be healthier. But not just healthier but happier too. If we lose sight of that then this is just a waste of time. It’s everything. It’s the time, it’s the health, and it’s the happiness… And it’s the money. Tom: Yeah, I’m a big fan of meal planning in practice. I haven’t done it often enough. I’ve done some of it where you go to a place and they have it all precut (which is awesome) but it costs more. But the convenience of having these frozen bags where most of them go into the crock-pot or something. It becomes the most convenient thing. Even quicker than ordering a pizza or something like that. So this has been great. I hope it really encourages people to eat healthier and get some exercise and do it all on a budget. Can you let everybody know what you’ve been up to? Brad: Sure. I’m the co-host of The ChooseFI podcast. We record and publish twice a week actually. Monday and Friday the show comes out. If you’re interested in financial independence and want to check us out, I would say episode 100 is a great place to start. Or just head over to choosefi.com/start. We have some info on how to become a member, a member of our Facebook group. I know you’re a member of our chooseficanada group, right? Brad: Is there another one? Tom: Yes, I’m also on the Alberta group but the Canada group is the most active having more people in it. It’s a great place for everyone to get together and kind of talk about their finances. Brad: Yeah, we have 200 of those groups all across the world, so definitely check that out at choosefi.com/start. Tom: Great, thanks for being on the show. Brad: Yeah. Thanks again. This was fun. Thanks Brad for the tips on living a healthy and frugal lifestyle. You can find the show notes for this episode at maplemoney.com/bradbarrett. Are you a fan of ChooseFI? Make sure you check back next week when we have the other half of the team on the show. Jonathan Mendonza will be discussing how to create space to execute a fully-funded lifestyle change. It’s a great episode that you won’t want to miss. See you next week.